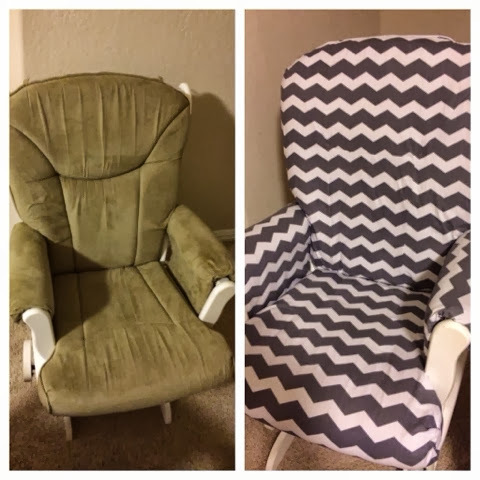 Home DIY Diy recovered nursing chair! At 39 weeks I'm waiting and waiting for this new baby boy to decide to make an appearance. Luckily my parents are here and with my moms help I recovered my nursing glider. It was this ugly beige green and I fel in love gray and white chevron. So we took each of the cushions and traced out a pattern. Adding 0.5" for seam allowance I think it turned out great. They best part is I can take off the chevron cover and wash it! Another bonus, it looks like a completely new glider!